Have you gotten tired of me starting out with weeding and bug control yet? No? Good for you, because maintenance is very important to a successful garden. 🙂 Once we had done that, we once again hilled up the potatoes (see my previous post). 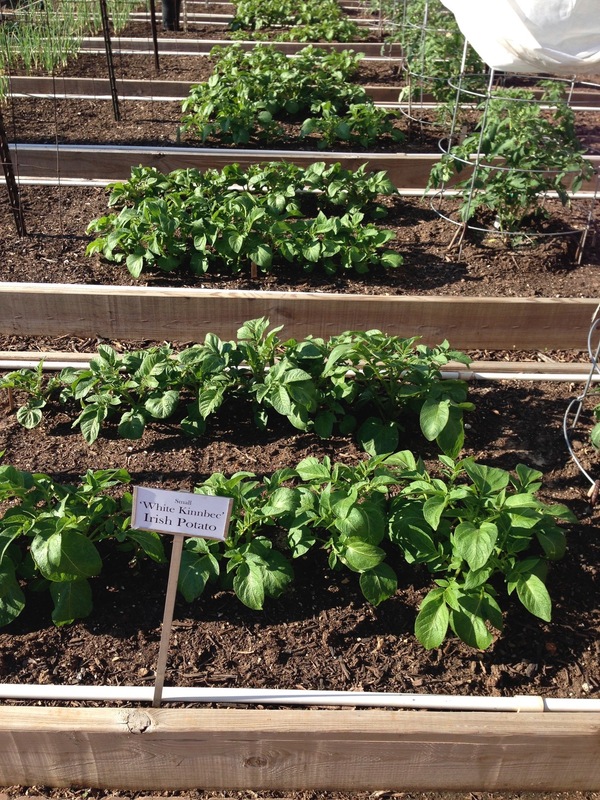 As you can see from the pictures below, the potato plants are doing great! 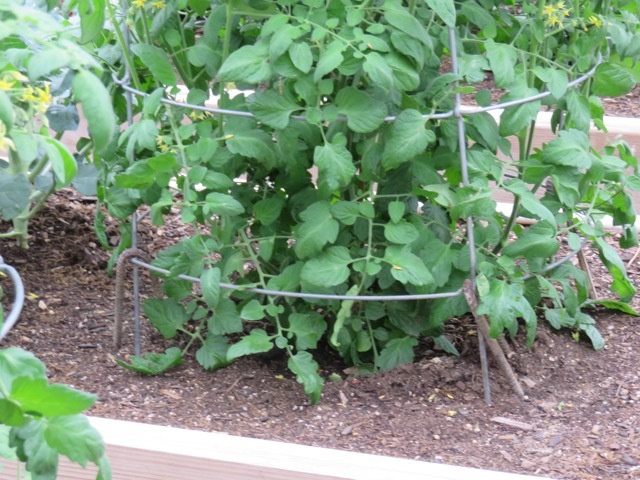 They are overflowing their beds into the walkways, and starting to eye the area where the cucumber vine is (to the left, where the trellis is, in the first picture below). 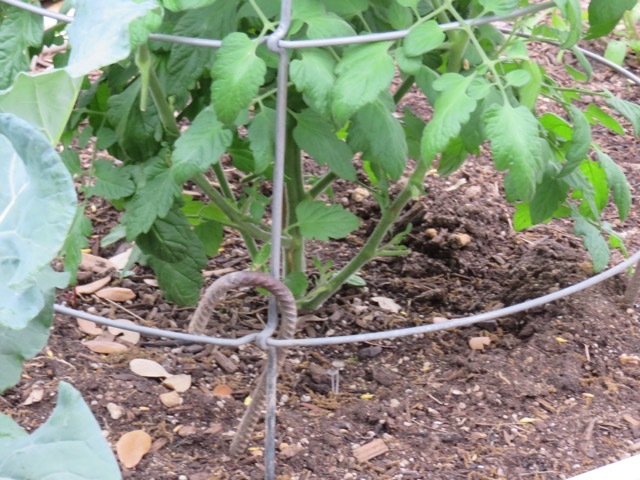 To prevent a cucumber-potato war, we used some short bamboo stakes to restrain the exuberant potato plants. We intentionally hid these stakes within the leaf canopy so they are not visible. One of our gardeners found a red and black bug among his potatoes and, to be honest, I wasn’t sure exactly what kind of bug it was, so I took a picture and emailed it to Molly Keck, entomologist, and our Extension Program Specialist for Integrated Pest Management (IPM) in Bexar County and all-around bug expert. She identified it as a mirid. That’s not a good one. Squish it if you see it. Both varieties of tomatoes are doing well. Here’s a look at one of the BHN 968 plants. I am 5’4” and this tomato plant is taller than I am. 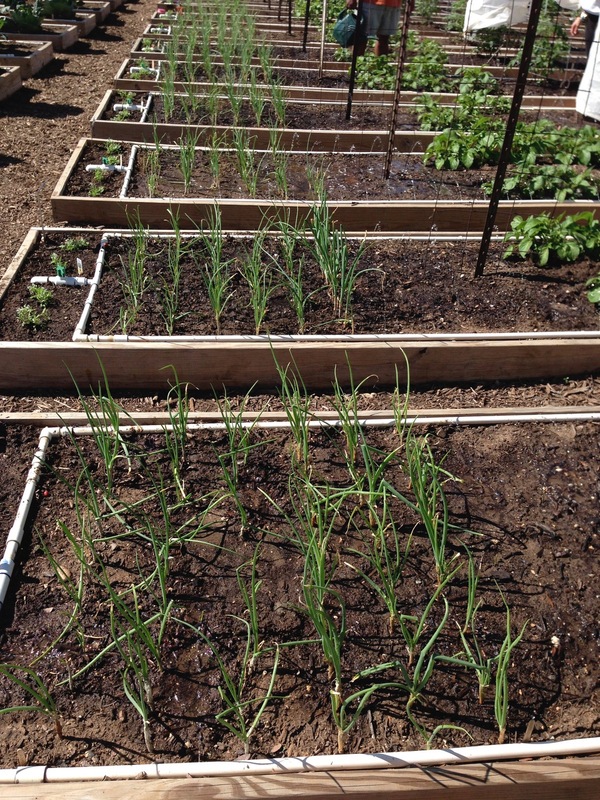 The onions are also doing well. Our gardeners harvested a few, and we removed any buds that were forming at the top of the onions. (See middle pic below.) Onions bolt for a variety of reasons—drought stress (hmmm, unlikely, given our weather lately), a cold snap (sends it into propagation mode), basically, environmental stress. Most of them are not bolting, so we are not worried about a bud here and there. Our author’s choice 🙂 bonus picture(s) this week is garden sage, left to flower, and filling a raised bed at the CVG. Have you considered growing extra herbs just to let them flower? Sage has beautiful flowers, and attracts bees. (The bees were pretty docile; I was taking all sorts of picture of them, and not one of them asked me what I was doing or showed any signs of being disturbed.) Generally speaking, some people feel herbs don’t taste as good once they are allowed to flower, and some leaves may become bitter. See what you think. Or grow extra! 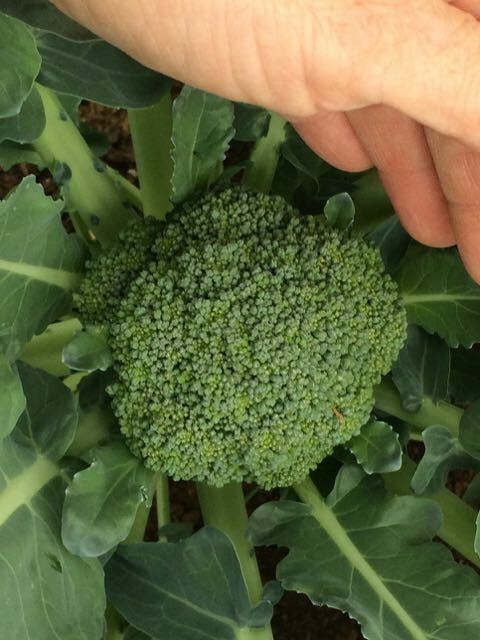 Before our day was over we fertilized our tomatoes and flowers, and we also drenched the cabbage/broccoli/kale with liquid Bt diluted to 2 oz per gallon of water, to help control the cabbage loopers. It was a busy Saturday morning at the CVG. 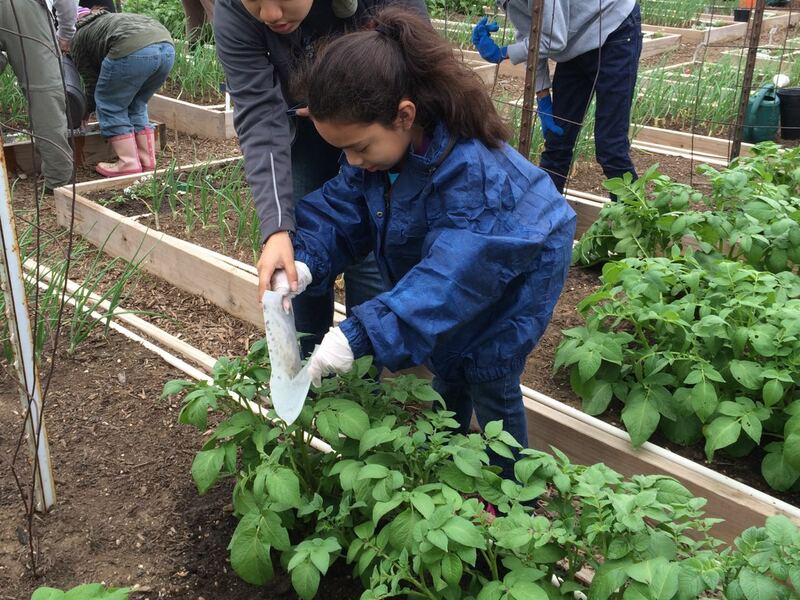 Our gardeners started out with their usual weeding and inspecting for bugs. We removed the wraps from both tomato cages and folded them up so they could be packed away for next year. 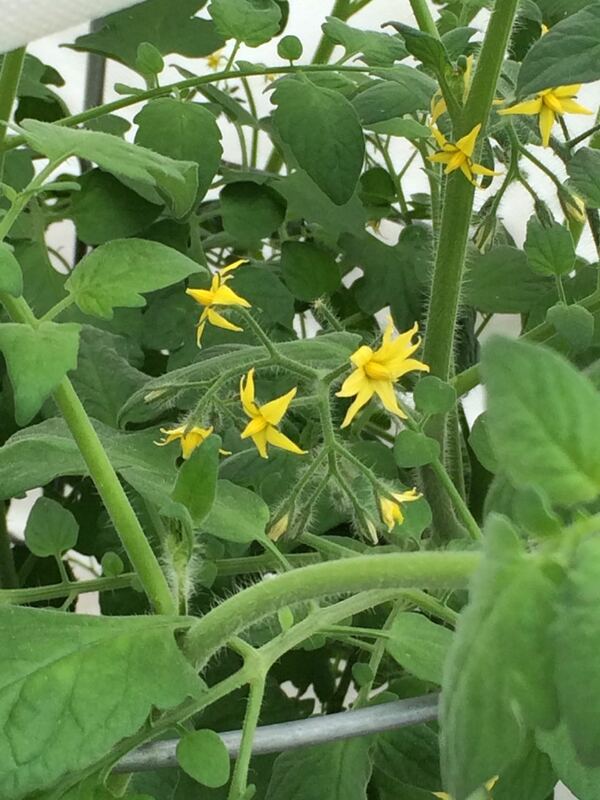 Once uncovered, we snipped off any tomato leaves or stems with leaves that were on contact with the ground. This will reduce possible diseases. The picture below on the left is of a plant that has not been pruned up yet, and the picture on the right shows one that has. What a big difference! We ‘hilled up’ the potatoes…they were originally planted with a bit of a hill between the two rows, and we used our hand cultivators to scratch 2-3” of soil from the hill to raise the level of soil around the potato plant stems on the back side of the plant about 3 inches. Some of the gardeners got more compost from the composting area to add to their hills. We also planted a ‘Diva’ cucumber. First, we measured 2” from the middle of the trellis and dug the hole. Then we carefully removed the plant from the container, turning it upside down and cradling it, with a few taps to get it loose of the container if needed. 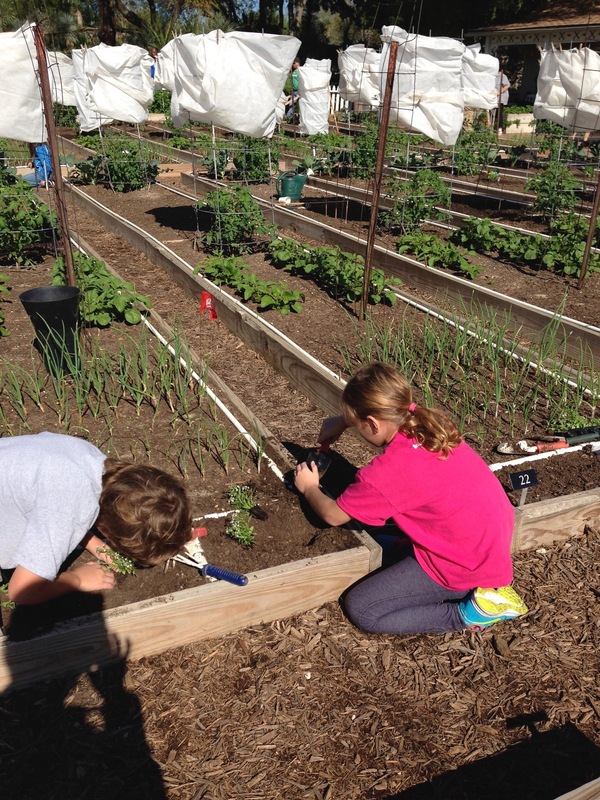 There was also a Junior Master Gardener activity in the area where the strawberry trials were going on. Our gardeners were asked to assist by picking three of the largest strawberries they could find. These were weighed and the information noted. Afterwards, they were each able to try a strawberry too! We finished up with fertilizing (hope you are fertilizing your own gardens as well..just follow the directions on whatever fertilizer you are using) and a final check of the beds. Here’s a few bonus pictures…there are a couple of purple martin birdhouses at the CVG—they help us keep the bug population under control—and we have a lot of residents! If you see the houses at the CVG, the entrances are not very visible so you may think that the birds are locked out of their nests, but this isn’t the case. These houses have small entrances to make it harder for other types of birds to take over the nesting areas. 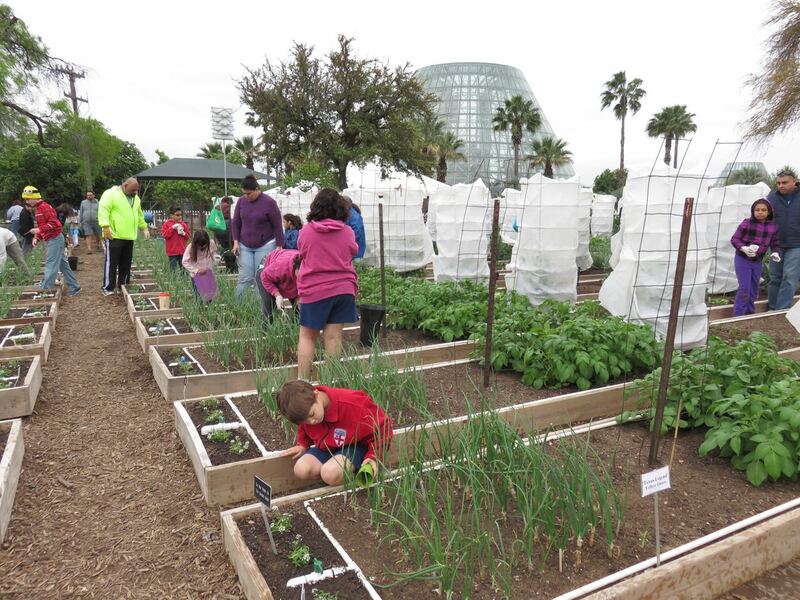 Last Saturday, April 4, was a productive day at the Children’s Vegetable Garden at the San Antonio Botanical Garden. It was Week 7 for us, and the day started with our gardeners inspecting their plots, looking at the general health of the plants and removing bugs and weeds. 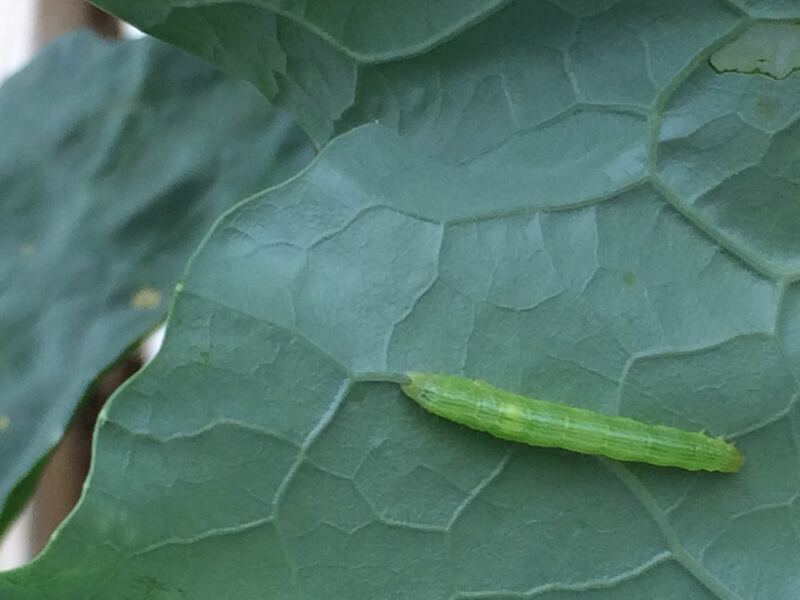 Cabbage loopers (pic below) were very active in the cabbage, so they spent time removing and squishing them with fingers or stomping them with feet. 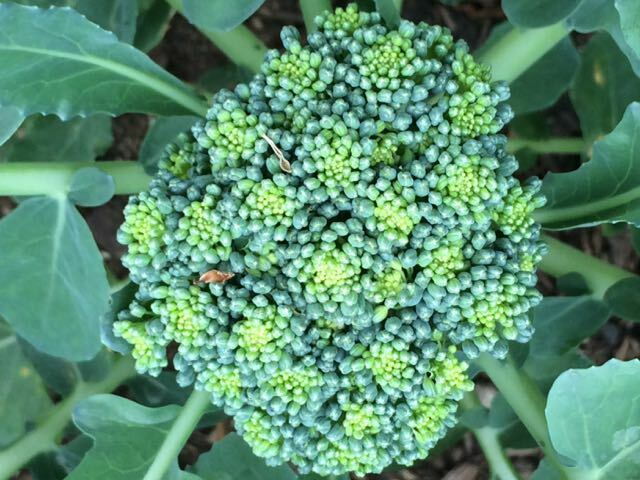 The broccoli head on the left has started to bolt, which means it is rapidly producing flowers…see the yellow starting to show, and how the head is looser than the one on the right? Some of the reasons this can happen is warm soil temperatures, environmental stresses (water, fertilizer, etc). Every now and then there might be a transplant not as strong as the others, too. If this starts to happen, you can pick and eat the head early. Once the weed and bug removal was done, we moved on to fertilizing. Remember to fertilize carefully, where the plants will benefit from it. Since it was a windy day, our gardeners were careful to spread the granular fertilizer low to the ground so it would not blow away. 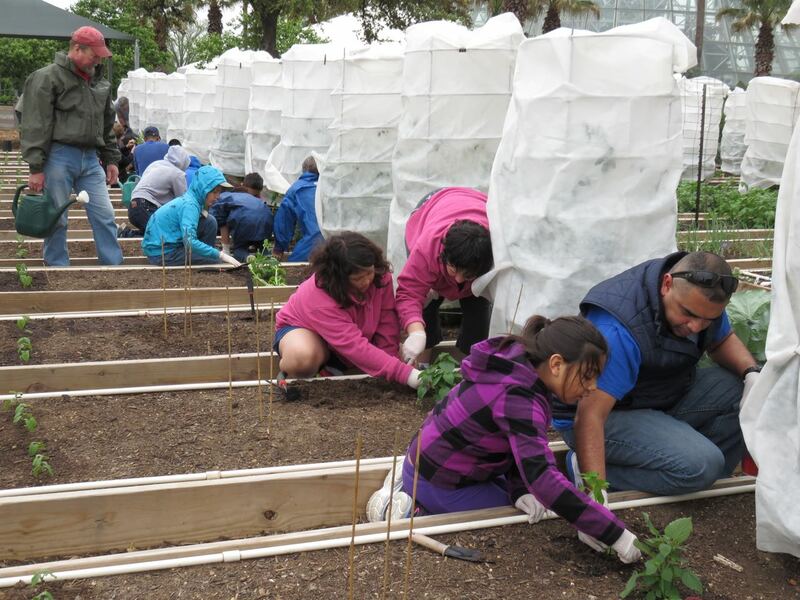 We also had some more planting to do… we planted petunias and yellow squash seed. Remember that squash seed is not planted very deep…we planted ours vertically, with the point of the seed just below the soil. We were going to plant ‘diva’ cucumbers transplants but will be doing that next week. You can certainly plant yours now too. 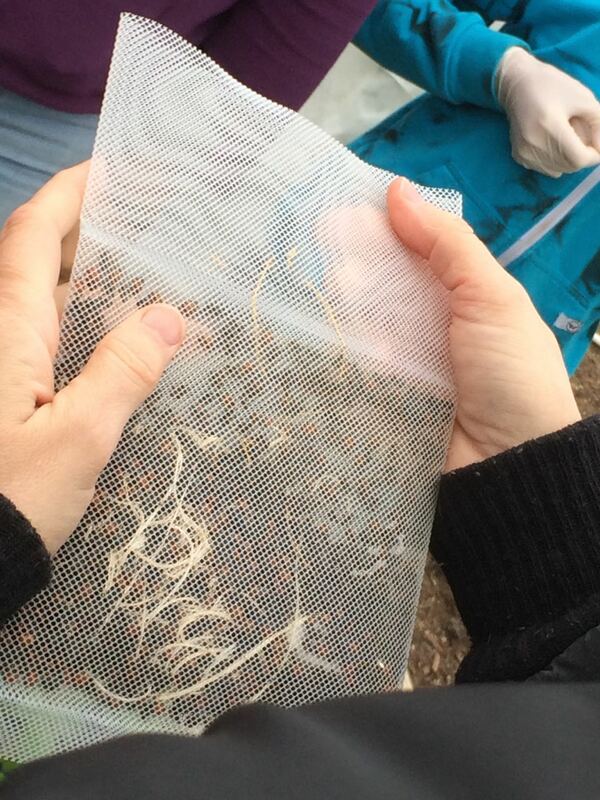 Today we also did something special…released ladybugs into the garden! 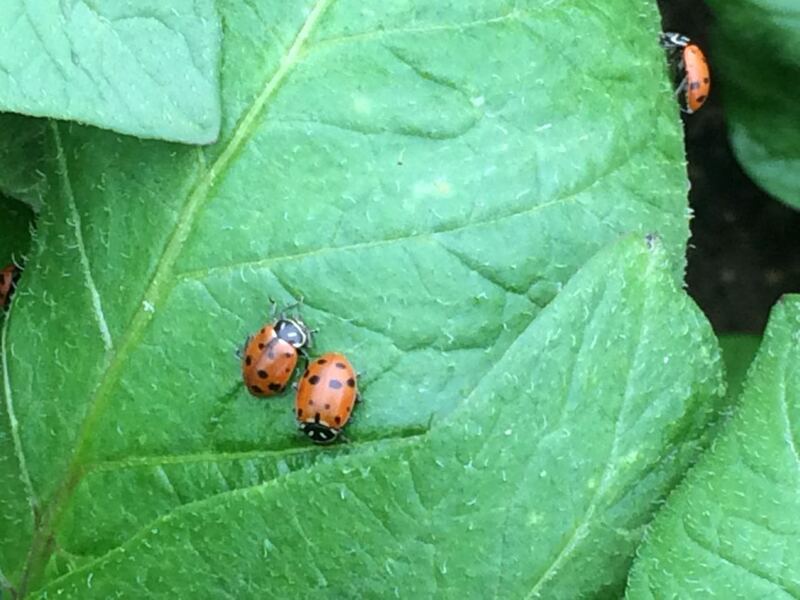 Ladybugs are a beneficial insect and will help keep aphids, scale, and other soft-bodied insects under control. Chocolate Mint! In the last several weeks, the mint has started growing like crazy! Mint is a very easy plant to grow as long as it has enough water (and light). It might, in, fact, be a bit difficult to control, but in a separate bed like this, it doesn’t have much of a chance to take over the garden. Chocolate mint is named that because some people think it has a chocolately mint flavor, sort of like a Peppermint Patty. There is also another, equally lush, bed of Yerba Buena (spearmint, in this case…Yerba Buena, which means ‘good herb’ is used to refer to several different herbs, generally—but not always—a mint.) Try a sprig of mint in your iced tea sometime, or even in hot tea. Or dry it for a mint tea. See you next week! 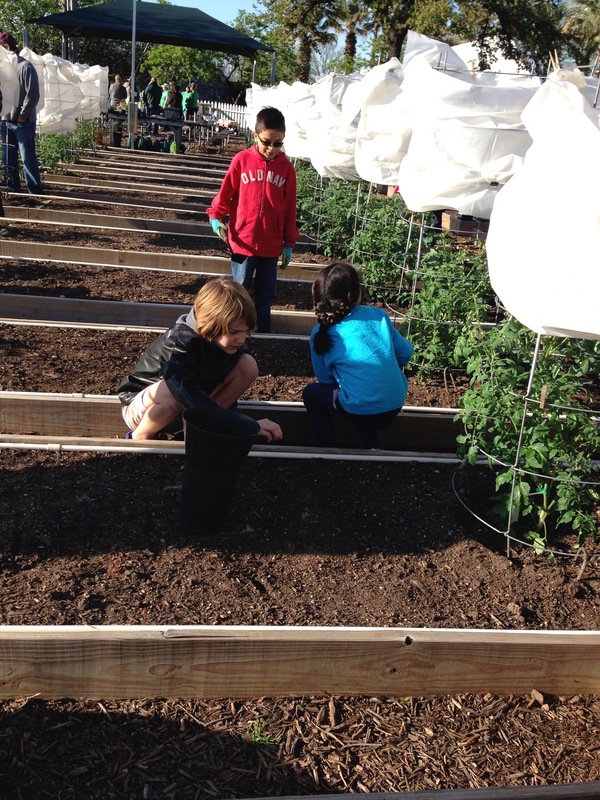 This morning our little gardeners opened up the wraps on their “Tycoon” and “BHN” tomatoes to make sure the plants are erect and the root ball is covered. We also had to make sure that the cages are firmly anchored. After checking the tomatoes we wrapped them up again making sure the wrap is open at the top like a chimney flue to let the sunshine in. The Irish potatoes “Red La Soda” and “ White Kennebec are all growing and looking very healthy. * Note * After the plot had been watered we applied 1 teaspoon of Sluggo Plus around each group of potatoes. We also checked the white and yellow onions and removed any yellow leaves. The “ Cheers” head cabbage, “Green Magic” broccoli and “Toscano “ kale were checked to see if there are any cabbage loopers and their eggs on the back side of the leaves and if any were found the cabbage loopers and eggs were manually crushed. * Note * We lightly drenched these plants with Javelin Bt mixed at a rate of 2 Tablespoons per gallon of water after being watered at the end of the day. 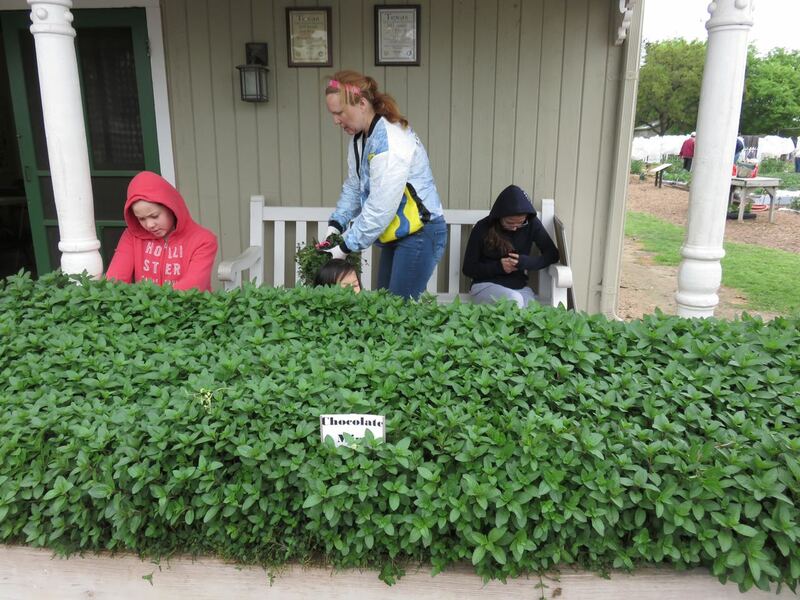 Today our Little Gardeners also planted Anise Hyssop/Licorice mint by carefully removing the plant from its container and planting it level with the soil line and watering well after planting. “ Little Ruby Alternanthera” another new Texas superstar for 2015 were planted ( 3 plugs ) These were evenly spaced and carefully planted at soil level, firmed in and watered in. Before planting the area was fertilized with 1 cup of organic granulated fertilizer.